I think what Magnatune and ccMixter represents is the future of music promotion, distribution and marketing. I've already been through the guerilla school of music in my life so taking on the future is something I've always been waiting for! Creative Commons and Magnatune are extremely proud to be working with international multi-platinum recording artist Salman Ahmad and are pleased to offer the audio source files from Salman's Natchoongi online under a Creative Commons Attribution-NonCommercial license, so that producers worldwide can use the sounds in remixes and new compositions. As a way to celebrate we are sponsoring a remix contest using those sources. The contest is closed to new entries. After all eligible entries have been received, the artists with the best remixes will be signed to a record deal with Magnatune and the winning entries will be released on a remix album later this year. Salman Ahmad is a doctor by training and a rock musician by profession. Salman went to school in his birth place of Lahore, Pakistan and then moved with his family to New York where he went to Tappan Zee high school in Tappan, NY. After graduating from high school in the U.S. he got his medical degree from Pakistan's King Edward Medical college in Lahore. While in school he was also a member of Pakistan's first pop band, Vital Signs, whose debut album sold a million copies. The album included the mega-hit anthem "Dil, Dil Pakistan". That success made Vital Signs into overnight pop stars. This is when Salman decided that he was going to give up his stethoscope and pick up his guitar. 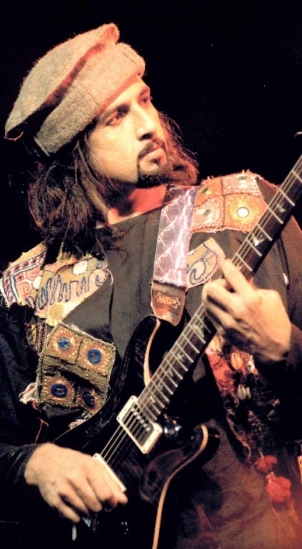 He left Vital Signs in 1990 and founded South Asia's biggest rock band, Junoon. Junoon has sold over 25 million albums (!) world wide and has the distinction of being the first ever rock band to be invited to perform at the United Nations general assembly by U.N. secretary-general Kofi Annan. Salman has also been appointed as U.N. goodwill ambassador for HIV/AIDS. He has personalized the "I care, do you?" U.N. poster campaign in Pakistan by paraphrasing a popular quranic verse "saving one life (from AIDS) is like saving the whole of humanity." He's been interviewed or quoted in major newspaper and magazine publications like the New York Times, Boston Globe, Los Angeles Times, Chicago Tribune, Newsweek and Time and has also appeared as a commentator on major television networks like CNN, BBC, NBC, ABC, CBS, FOX, MTV and VH-1 and other global media networks. Recently he has appeared in two documentary films: It's My Country Too on Muslim-Americans and Rockstar and the Mullahs which has won a SAJA Award. Both films have been broadcast worldwide on PBS and the BBC.